Wye Valley Area of Outstanding Natural Beauty at Wye Valley Area01600 710 846work Walking RouteThe Wye Valley Area of Outstanding Natural Beauty (AONB) is a protected landscape either side of the River Wye at the southern end of the border between England and Wales. The beautiful area, rich in heritage as well as natural assets, has a long tradition as a visitor destination. Indeed, it is widely recognised as the birthplace of organised tourism stemming from the ‘Wye Tour’ which became popular in the late eighteenth century. The Wye Valley Area of Outstanding Natural Beauty (AONB) has an impressive heritage with a rich historic tapestry, created by thousands of years of settlement and industry, from Prehistoric times to the present day. The industrial revolution started here and the legacy of the picturesque still echoes in a strong artistic and cultural identity. The Wye Valley Area of Outstanding Natural Beauty (AONB) offers a unique landscape with a fascinating history with so much to see and so much to do. The beauty of the Wye Valley inspires throughout the year, and the secret to its irresistible attraction lies in its quiet wooded glades, peaceful riverside pathways, spectacular viewpoints and towering historic ruins. All these, as well as intriguing local churches, picturesque villages and historic market towns, guarantee a wealth of attractions for the visitor. Enjoy fresh air and the challenge of adventure.The Wye Valley is the perfect place for you to enjoy a variety of activities even when mists shroud the hills and the river is swollen with rain. The secret to the valley’s attraction lies in the drama of its gorge and its dense woodlands. Use footpaths to explore the woodlands and discover hidden beauty spots. There are plenty of places for a family stroll or for a more demanding walk. Or, if you prefer more rugged pursuits, there’s a choice of canoeing, rowing, horse-riding, rock climbing, abseiling, caving and riding, both on and off-road. 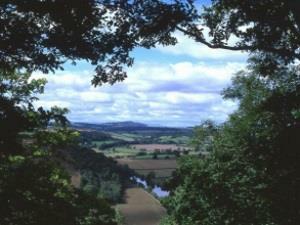 The Wye Valley Area of Outstanding Natural Beauty (AONB) is a protected landscape either side of the River Wye at the southern end of the border between England and Wales.